If your application is successful, it will be a condition of your admission that you have adequate funds to cover your fees and living expenses for the duration of your course. In many cases, these will derive from a scholarship or grant, and we provide information below on potential sources of such funding. Other students are self-funding throughout their time in Cambridge, relying on personal savings or support from family. It is essential that you think realistically about your funding before embarking on a research degree. 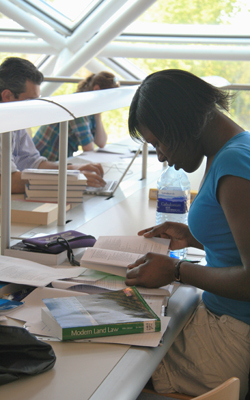 Full-time research is demanding and time-consuming: to try to do that work whilst subject to worries regarding your financial situation is very difficult, and under no circumstances will the University accept the need to earn money as a valid reason for failure to complete your research on time. You must also bear in mind that the University's regulations prohibit research students from undertaking any non-academic-related employment during their course, and strictly limit the amount of paid academic-related employment that research students are permitted to undertake during their course: no more than ten hours a week, and then only with the permission of their research supervisor and college tutor. Overseas applicants should note that this limit may be lower than the limit on paid employment permitted by your visa. Applicants who have funding from a grant should also be careful to ensure that they comply with any conditions from their funder regarding paid employment: for example, some permit no more than six hours of paid work per week. There are many funding opportunities at Cambridge from a wide variety of sources including the Cambridge Trust, Gates Cambridge, Colleges, Departments, Research Councils (Prospective PhD students in Law are eligible to apply for an Arts and Humanities Research Council (AHRC) Studentship and/or an Economic and Social Research Council (ESRC) Studentship) and central University funds. The most comprehensive information about such funding can be found on the Graduate Admissions website which provides detailed information about the University-wide funding competitions to which you can apply by completing the funding section of the Graduate Application Form (via the Applicant Portal). There is a really useful Cambridge Funding Search Tool (located under Funding Opportunities) which is the best collated source of information about funding offered by the University and Colleges and allows you to search for funding you are eligible for according to what course you are applying to and your fee status. You should also consult the websites of individual Colleges. In addition to the central funding awards, the Faculty of Law is pleased to be able to offer the following awards that provide either full or partial funding. Details are provided below. The Cambridge Law Journal, the oldest law journal associated with the Cambridge Faculty of Law, is offering a Studentship, tenable for three years subject to satisfactory academic progress, for a new PhD student commencing full-time doctoral research in 2019/20. The value of the Studentship will be up to the value of the applicable fees for a Home UK/EU or Overseas student, plus the applicable rate of maintenance. Studentships will be awarded on the basis of academic merit and research potential. The Studentship is suited to applicants with a common law background. The aim of the Studentship is to support and promote the study and research in core common law subjects, and preference may be given to applicants proposing research in such areas. Candidates who have applied for admission to the PhD and who wish to be considered for this Studentship should return the studentship application form to phdadmissions@law.cam.ac.uk by the studentship closing date of 31 March 2019. Queries about the Studentship may be addressed to phdadmissions@law.cam.ac.uk. The Faculty of Law is offering one studentship for a new PhD student commencing full-time doctoral research in any area of family law in 2019/20. The studentship is available to Home UK/EU and overseas students, and is renewable for a further 2 years subject to satisfactory academic progress. The value of a studentship will be £10,000 per annum and may be used by the student to contribute towards the University Composition Fee or to contribute towards maintenance costs. Candidates wishing to be considered for this studentship should apply for admission to the PhD by the PhD course closing date of 3 December 2018 and return a completed studentship application form to phdadmissions@law.cam.ac.uk by the studentship application closing date of 31 March 2019. The Faculty of Law is offering a studentship for a new PhD student commencing full-time doctoral research in 2019/20. The studentship is available to students from any country, and it is renewable for a further 2 years subject to satisfactory academic progress. Over the course of three years, the studentship will provide up to a maximum of £100,000 towards the costs of maintenance (capped at £14,500 per year) and tuition fees (capped at the applicable University Composition Fee). Candidates wishing to be considered for this studentship should apply for admission as a graduate student by 3 December 2018 and return the studentship application form by 31 March 2019. For more information about the Faculty’s Centre for Medicine, Law and Life Sciences, see www.lml.law.cam.ac.uk. The Managers of the F.W. Maitland Memorial Fund are able to offer one Studentship for Home/EU, or Overseas/Islands students applying to undertake doctoral research in legal history at the University of Cambridge, starting in October 2019. Studentships are tenable in the Faculty of Law, the Faculty of History, or the Faculty of English. The maximum annual value of the Studentship will be a sum equivalent to the total of the University of Cambridge’s minimum maintenance requirement for PhD students (which for the academic year 2019-20 is £14,130) plus PhD fees capped at the Home/EU rate (which for the academic year 2019-20 is £8,337). Candidates wishing to be considered for this Studentship should apply for admission as a graduate student by 3 December 2018 – please see the Graduate Admissions site. Candidates should also complete the studentship application form and send it directly to Mrs Alison Hirst, University of Cambridge, Faculty of Law, 10 West Road, Cambridge, CB3 9DZ or by email to phdadmissions@law.cam.ac.uk by 30 January 2019. There will be an election to two Wright Rogers Law Scholarships in August 2019. Candidates for the Scholarships must have successfully completed a course of study qualifying them for a degree in any university or similar institution in the United Kingdom and have spent at least one year in the study of law. If elected, a Scholar will be required to carry out study or research relating to the Laws of England under the direction of the Electors. The tenure of a Scholarship will be for one year from 1 October 2019 in the first instance, but a Scholar will be eligible for re-election for a further two years. A Scholar must already be or must become a member of the University. The annual value of each Scholarship will be at least £3,000 and will be determined by the Electors of the Wright Rogers Scholarship Fund after taking into account any other financial resources that may be available to the Scholar. Applications for a Scholarship, accompanied by an outline of the candidate's career and proposed course of study at Cambridge, should be submitted to Mrs Alison Hirst, Faculty of Law, 10 West Road, Cambridge, CB3 9DZ, by not later than 1 July 2019. Candidates must also arrange for two persons each to send a written reference to Mrs Hirst so as to arrive by the same date. The Arnold McNair Scholarship Fund supports a one-year Arnold McNair Scholarship in the area of international law. The Scholarship is open to any member of the University of Cambridge who has kept at least eight terms and who is a candidate for, or has been classed in, Part II of the Law Tripos. A letter of application, together with a statement of the nature of the further study or research that the applicant proposes to undertake, should be submitted to Mrs Alison Hirst, Faculty of Law, 10 West Road, Cambridge, CB3 9DZ, by 25 June in any year. The present value of the scholarship is at least £5000. If the available income of the Fund is sufficient, a second Scholar may be elected.